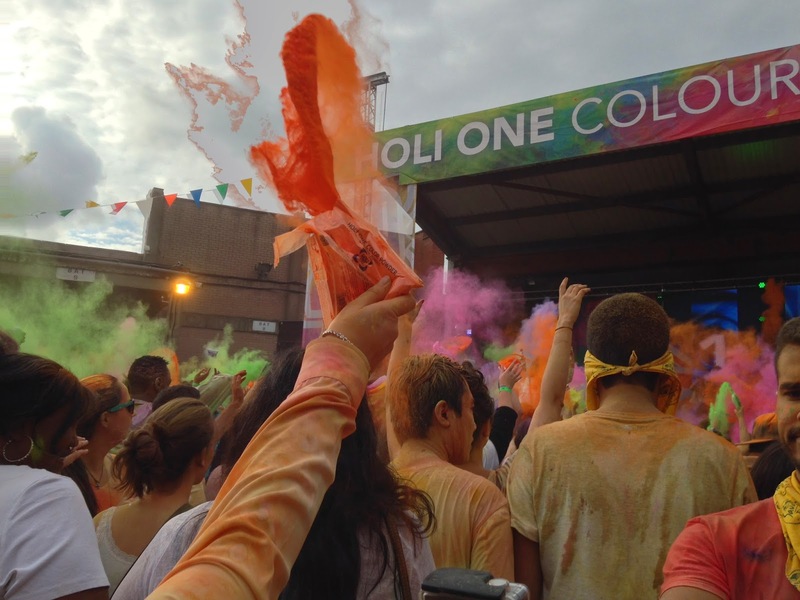 This weekend myself and a few friends headed into Birmingham for the Holi One Colour Festival, which was inspired from the Indian Holi festival…you go in as much white as possible, buy the powder once you're there & it's time to dance around, get colourful and slightly messy! For years now I've wanted to take part in the Colour Run, and as I haven't been good enough to train…this seemed like the next best thing. After a dilemma finding the right outfit a few days before, on the Saturday morning I was dressed in as much white as possible, met with my friends & the four of us headed towards the venue. Keeping an eye out for any others dressed in white making their way towards The Rainbow Venue in the Custard Factory area and after almost getting lost we finally found where we were going. 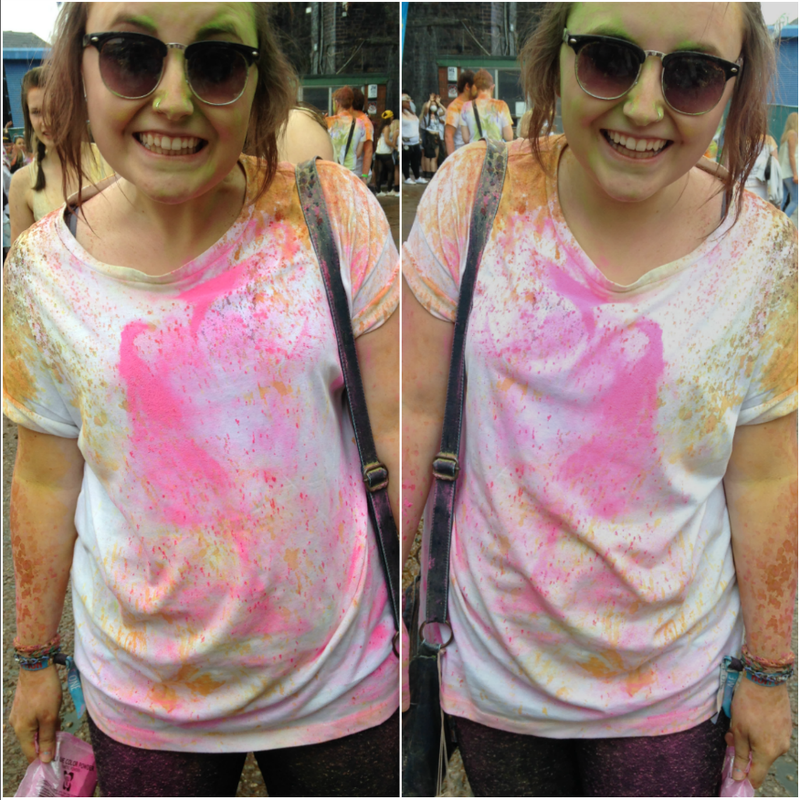 We arrived a little later than the time it started, so were stuck out a little being the only 'clean' people, but that soon changed…5 minutes inside & we'd already covered ourselves in colour. Face paints were free so we waited to get one, sadly we spent most of our time in the queue but I actually find it quite relaxing, as everyone within the crowd seemed either very drunk or high. So keeping my distance whilst enjoying myself felt much better. …I do usually drink at events like this, but for the price of one drink I decided to enjoy the day sober. Although there was a plan in place, no one actually stuck to it. 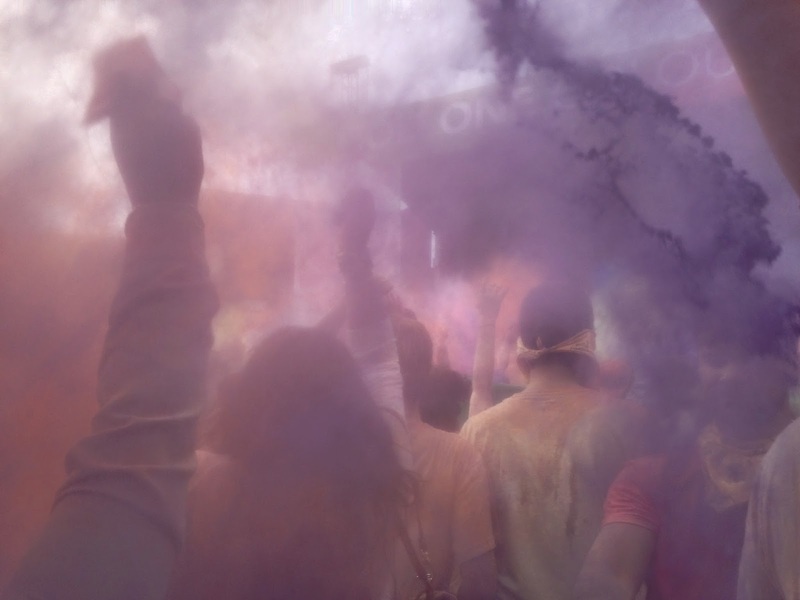 The idea of the day was every half hour/hourly countdowns were made for everyone to throw there powder in the air. The dj on stage would announce the time it would happen & which colour they wanted us to use…Obviously throughout the day we covered one another and it was great to see everyone getting involved. The downside of the day was the down pour of rain for almost all of the afternoon…the worst thing is the days before were lovely & sunny and so were the days following, just our luck really!? But I embraced the weather, stood in the rain and allowed the colour to cover me. I was literally green one minute, then pink/purple & suddenly ended the day looking a little orange. Crazy but I really enjoyed it as part of the day, I've wanted to experience something like this for so long and I made sure I didn't let the weather get me down. 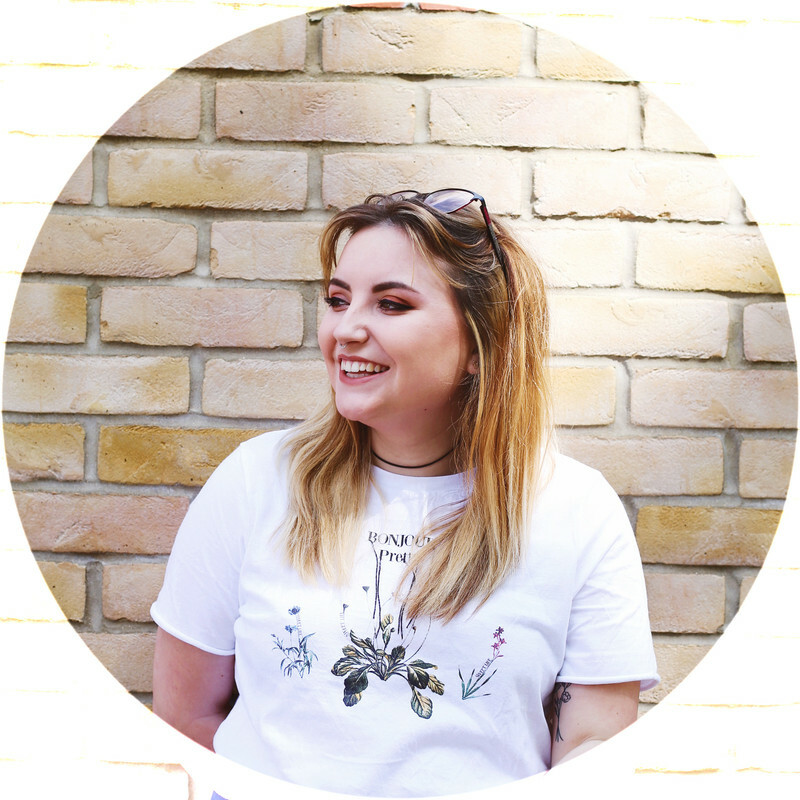 Once we'd decided we'd had enough of the day (leaving at the right time, before we all got tired & bored), walking through town we we're given so many weird looks and the train journey we thought best to keep stood up, with the ticket man thanking us greatly. If I could experience this day again or another event happens again next year, I'll definitely be re-purchasing tickets and dragging a few more friends along. Something like this has been on my 'bucket list' for so long now, so I'm excited that I can finally tick something off. Did you go? Or have you been to an event like this? Adorable! 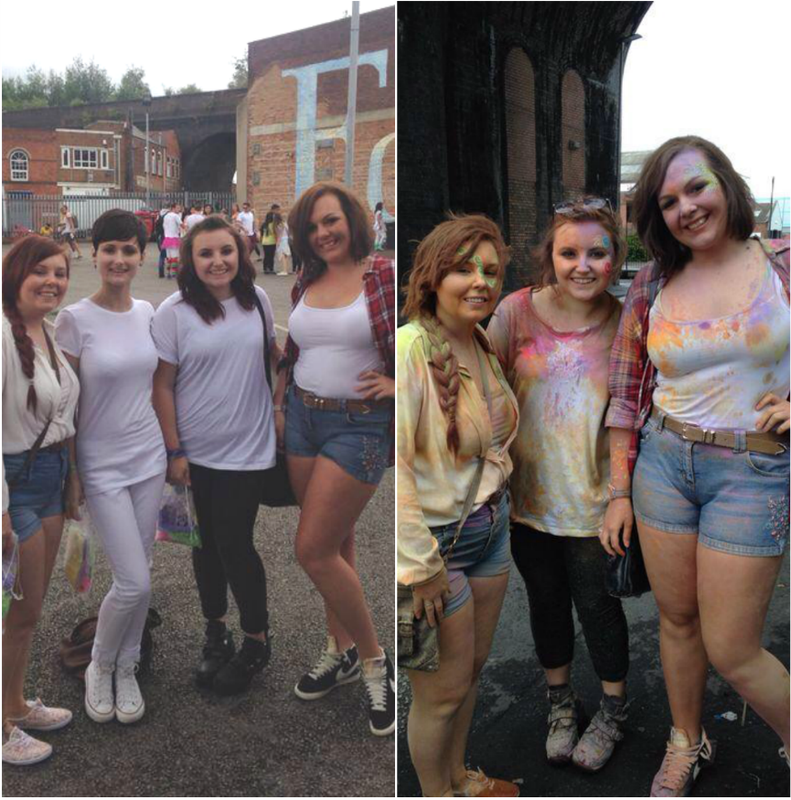 Love the before & after pics...looks like you had fun!